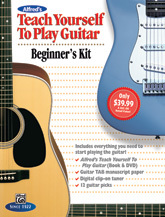 Alfred’s Teach Yourself To Play Guitar: Beginner's Kit contains everything you need to start playing guitar in one handy box and at an incredible price. For only $39.99, you get a $62.00 value that includes: * Alfred's Teach Yourself To Play Guitar method with DVD. Beginners of all ages can start their journey to a lifetime of playing either acoustic or electric guitar. Start with the fundamentals, and learn about various guitar types, how to care for your guitar, and reading standard musical notation and tablature. You will learn to play in an array of musical styles, including rock, heavy metal, blues, country, jazz, and folk. The DVD correlates to all the lessons in the book. * Alfred's Guitar TAB Pad includes four staves of standard notation and TAB on 32 double-sided sheets. Write out your favorite songs, techniques, exercises, or you can even write your own songs! * A digital clip-on chromatic tuner. This easy-to-use tuner clips directly on your headstock so you can tune quickly and easily anywhere. * A set of three guitar picks for clear-sounding strumming and picking. Whether you are dusting off a guitar from your closet or buying a new instrument, this is the perfect collection of tools you need to start playing now!